Hi and thanks for popping in today. TGIF! I have another TCP card for you today. This is another one I made for TCP Tues 149. I used the Bear Hugs stamp set. This little guy is so cute! I decided not to even color him. I stamped him on kraft, cut him out, and then paper-pieced his belly with white card stock. I cut out his paws and nose and popped them up a little to add a little dimension. The heart was paper-pieced from a gorgeous paper pack from Jillibean, Dutch Mustard Soup. I added a wood button from Maya Road, and a bow from some green ribbon I found in my stash. See you soon! Have a nice weekend. Jody, I am in love! This card is THE BEST!!! Oh my goodness, how cute! Love him! Love it! 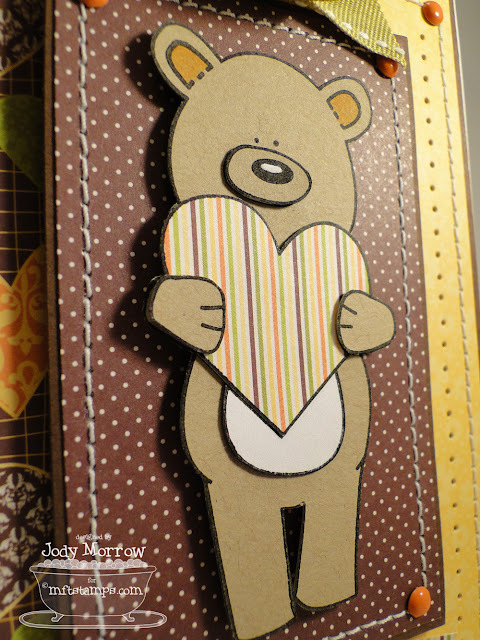 Your colour choice is fantastic- I love that paper- gotta get me some:) And BigBear is so dapper looking on craft cs!! This is just a super awesome perfect card! How CUTE is this! He totally makes me smile!!! My exact word when I saw this was "YOWZA" This is flippin' cute, Jodi! LOVE him stamped on Kraft! this made me say "awwwwwww" out loud! swwoooon!~hugs! Love this and I just got that pad in the mail today. I dig some mustard colors, myself. Awesome! I love this card! It gives such a warm and fuzzy feeling.